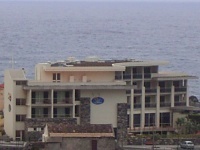 Comfortable 3 star hotel in Porto Moniz, situated in the Northwest of Madeira. 46 Large rooms are spread over 3 stages. Four of the rooms offer a mountain view while all other rooms offer sea view and side view on the coast of Madeira. In summer season the hotel attracts a lot of Portuguese people who prefer a peaceful village above a large village such as Funchal. Hotel Moniz sol is situated close to the sea at the side of village of Porto Moniz. Porto Moniz is a rather small village so the center that has a few shops, restaurants and sidewalk cafes is on walking distance. There is sufficient (free) parking space available on the road in front of the hotel. 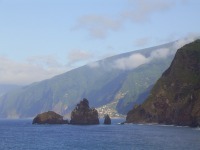 Porto Moniz is about 46 km away from Funchal and 60 km from the airport. Breakfast includes bread, cornflakes, bacon, eggs, cheese, ham, coffee, Tea, melk, fruit. Te buffet is served in the non-smokers restaurant. The decoration is sober but very clean. On sunny days it can get warm inside due to the lack of airconditioning. We didn't try the dinner because Porto Moniz leaves a large choice of Restaurants and we prefer to dine outside. Hotel Moniz Sol is a very cheap hotel (Summer 2007, 65 Euro for 2 Persons + bed and breakbast). The rooms offer a fantastic view upon the sea and the North coast of Madeira. At nights we sat on our balcony for several hours to listen to the waves and to watch the street lights of Seixal, Sao Vicente and Ponta Delgada. The bath rooms shines and the rooms are clean and comfortable. Porto Moniz is a very quiet village in the evenings and then it is nice know that the hotel bar remains open until midnight. Drinks and cocktails are very cheap as well, but this is kinda typical for this region. The further away from Funhcal, the cheaper everything becomes. The hotel personel is very fiendly. The only disadvantage is the lack of airco in the bar and restaurant. The hotel offers value for money and together with its exceptional sea view we recommend this hotel to anyone who wants to visit Porto Moniz. Smokers get a room on the first floor, where the view from the room is less spectacular. On the second and third floor an ashtray is provided on the balcony. See our page about Porto Moniz to get more restaurant suggestions.